Cannabinoids can modulate bone remodeling, often promoting bone growth and inhibiting bone resorption, and some are currently being studied for prevention and treatment of osteoporosis. Our bodies increase the number of cannabinoid receptors present in tissues that are injured or inflamed, indicating a role for cannabinoids in healing. Several cannabinoids have in fact, been shown to prevent cartilage breakdown in joints, protect connective tissue from injury due to lack of oxygen, and speed the repair process in damaged skeletal muscle. Extensive research has shown that cannabinoids are excellent for reducing muscle spasm and associated symptoms, even in refractory cases of multiple sclerosis or spinal cord injury. 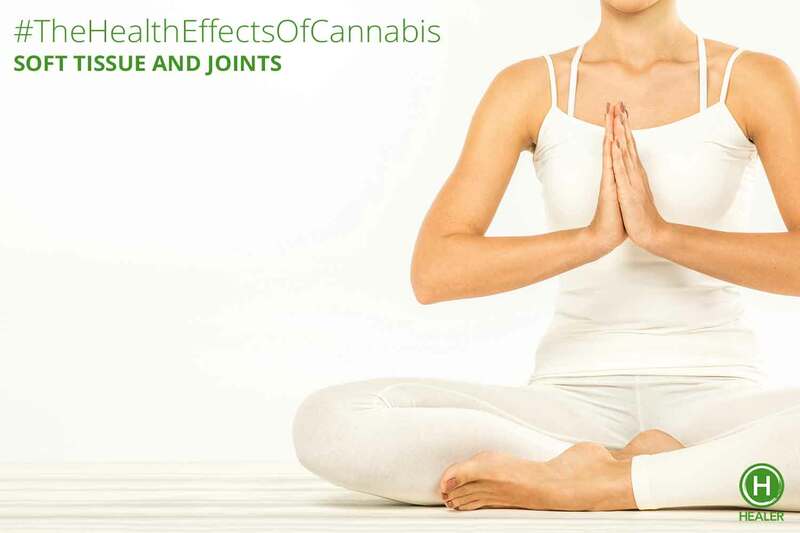 Patients often report improved flexibility and enhanced recovery following exercise when using cannabis. The active component of marijuana, Delta(9)-tetrahydrocannabinol, activates the CB1 and CB2 cannabinoid receptors, thus mimicking the action of endogenous cannabinoids. CB1 is predominantly neuronal and mediates the cannabinoid psychotropic effects. CB2 is predominantly expressed in peripheral tissues, mainly in pathological conditions. So far the main endocannabinoids, anandamide and 2-arachidonoylglycerol, have been found in bone at ‘brain’ levels. The CB1 receptor is present mainly in skeletal sympathetic nerve terminals, thus regulating the adrenergic tonic restrain of bone formation. CB2 is expressed in osteoblasts and osteoclasts, stimulates bone formation, and inhibits bone resorption. Because low bone mass is the only spontaneous phenotype so far reported in CB2 mutant mice, it appears that the main physiologic involvement of CB2 is associated with maintaining bone remodeling at balance, thus protecting the skeleton against age-related bone loss. Indeed, in humans, polymorphisms in CNR2, the gene encoding CB2, are strongly associated with postmenopausal osteoporosis. Preclinical studies have shown that a synthetic CB2-specific agonist rescues ovariectomy-induced bone loss. Taken together, the reports on cannabinoid receptors in mice and humans pave the way for the development of 1) diagnostic measures to identify osteoporosis-susceptible polymorphisms in CNR2, and 2) cannabinoid drugs to combat osteoporosis. The endocannabinoid (eCB) system, like the better-known endorphin system, consists of cell membrane receptors, endogenous ligands and ligand-metabolizing enzymes. Two cannabinoid receptors are known: CB(1) is principally located in the nervous system, whereas CB(2) is primarily associated with the immune system. Two eCB ligands, anandamide (AEA) and 2-arachidonoylglycerol (2-AG), are mimicked by cannabis plant compounds. The first purpose of this paper was to review the eCB system in detail, highlighting aspects of interest to bodyworkers, especially eCB modulation of pain and inflammation. Evidence suggests the eCB system may help resolve myofascial trigger points and relieve symptoms of fibromyalgia. However, expression of the eCB system in myofascial tissues has not been established. The second purpose of this paper was to investigate the eCB system in fibroblasts and other fascia-related cells. The investigation used a bioinformatics approach, obtaining microarray data via the GEO database (www.ncbi.nlm.nih.gov/geo/). GEO data mining revealed that fibroblasts, myofibroblasts, chondrocytes and synoviocytes expressed CB(1), CB(2) and eCB ligand-metabolizing enzymes. Fibroblast CB(1) levels nearly equalled levels expressed by adipocytes. CB(1) levels upregulated after exposure to inflammatory cytokines and equiaxial stretching of fibroblasts. The eCB system affects fibroblast remodeling through lipid rafts associated with focal adhesions and dampens cartilage destruction by decreasing fibroblast-secreted metalloproteinase enzymes. In conclusion, the eCB system helps shape biodynamic embryological development, diminishes nociception and pain, reduces inflammation in myofascial tissues and plays a role in fascial reorganization. Practitioners wield several tools that upregulate eCB activity, including myofascial manipulation, diet and lifestyle modifications, and pharmaceutical approaches. Kogan, Natalya M., et al.